Each ear is made up of 3 parts. There is the outer ear which you can see, and which gathers the sound. Further in, the outer ear joins the middle ear on each side of the head. Deeper still, there is an inner ear on each side. The sound goes down the ear tube, which is part of the outer ear, into the middle ear on that side. 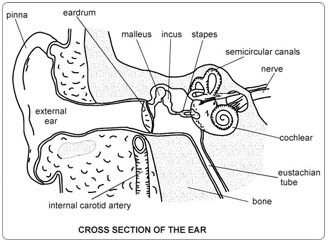 The ear drum stretches across the deepest part of the ear tube between the outer ear and the middle ear.The drum is about 8 mm (a third of an inch) across. It is made of thin skin like the top of a real drum. Your ear drum has a hole in it, which doctors call a perforation. Germs may go through the hole and cause an ear infection, particularly if you get water in the ear whilst hair washing, taking a shower or swimming. The hole in the ear drum will stop it from vibrating normally, and this may cut down your hearing. Sealing up the hole in the ear drum should prevent you getting so many ear infections, and may improve the hearing. Just how much hearing improvement depends where in the drum the hole is, and how big it is. Stop smoking and get your weight down if you are overweight. (See Healthy Living). If you know that you have problems with your blood pressure, your heart, or your lungs, ask your family doctor to check that these are under control. Check the hospital’s advice about taking the Pill or hormone replacement therapy (HRT). Check you have a relative or friend who can come with you to the hospital, take you home, and look after you for the first few days after the operation. Sort out any tablets, medicines or inhalers that you are using. Keep them in their original boxes and packets. Bring them to the hospital with you. On the ward, you may be checked for past illnesses and may have special tests to make sure that you are well prepared and that you can have the operation as safely as possible. Please tell the doctors and nurses of any allergies to tablets, medicines or dressings. You will have the operation explained to you and will be asked to fill in an operation consent form. Many hospitals now run special preadmission clinics, where you visit for an hour or two, a few weeks or so before the operation for these checks. If you have a cold in the week before your admission to hospital, please telephone the ward and let the ward sister know. The operation will usually be put off, and you will be given time to get better before being sent for again. You will have to get over the cold before the operation can be done because by having an anaesthetic the cold could turn into a serious infection in the chest.